A man stands on a cliff edge looking out to sea and far distant shores. Ships sail forth on calm waters. They voyage in the direction of the distant shores. The man stays behind. He has sent the ships ahead of him, or to bring back news and information from faraway places. He is laying the groundwork for his own personal voyage in the near future. He must embark on a grand venture to new worlds, for what he seeks cannot be found in his own. He will travel out to meet it elsewhere. He is ready for action, but not everything is in place. He might be waiting on certain news before he can make a move. The man must exercise patience. Three Wands are planted firmly in the ground. One to his right, which he gently leans on, the second to his left, and the third behind him, also on the right. The Three Wands play an integral part in the man’s future. He has brought them to the cliff top so they may share the view. He wants them to be a part of it. The man is dressed in a travelling cloak of high quality. He is preparing for action and travel. The red colouring of the cloak reflects the passion he has for life, his ambition and determination to succeed. A green mantle is draped around his shoulder suggesting his desire for success in the material world. Green also introduces earthly stability to Fire. He now shoulders responsibility, or may be committing to something. The blue of his right sleeve aims to remind him of his spiritual duty when taking action. A checkered sash of black and yellow hangs diagonally on his cloak. This I suggest symbolises the possible differing viewpoints of others he is involved with. He must incorporate these views or opinions into the overall plan if venturing forth with others. This sash may be coloured black and white in other decks. It might suggest the influence of both the Magician and High Priestess in bringing him to this point of expansive release. The Wand he leans on carries many representations. It may suggest he still relies on the support of others, or perhaps needs another’s help to implement plans. The Wand can suggest he is not on his own. He has someone to turn to, someone on his side, someone who wants what he wants, sees what he sees. Of all the Wands depicted, this one is closest to him. This could be a special person, but could also reflect his need to retain independence and personal identity regardless of company present. He may have joined with another, or others, but he is still his own person, and at times will want to assert it. He is used to doing his own thing and going his own way without check or caution. He may revert to this behaviour when confronted with resistance or disagreement. The man stands with his back to us. We cannot see his expression, but his shoulders are not slumped. He stands confidently and assuredly. His physique appears strong and healthy. He is possibly young, a pioneer, a maverick. He has moved away from his past in favour of a dazzling future ahead. The Wand depicted at his back could symbolise that which he leaves behind. It could be the life in The Ace he has outgrown, or his single status. It could be a bad experience, a failed relationship, or an unfulfilling career. What he leaves behind may also be his home, country, family and friends. Leaving it all behind may not be as simple as he thinks, for this Wand could find it trailing like a shadow wherever he goes. He may not be able to escape his past. He might even want to return to it. The Wand can be significant on many levels. It could suggest a third party not exactly in line with the other two Wands, which although positioned quite far apart, seem to share equality. This Wand might be a secret third person in the background, someone flying below the radar, or someone who must be reluctantly accommodated. With Three being a number of creation and birth, the third Wand can also symbolise the product of union between the two main Wands, their offspring. The sky dazzles with brilliant sunlight. The man can see for miles and miles. Not a cloud hampers his view. There is an impression of heat. Mountains and hills line the far shore line. These suggest challenges ahead, but none that should be worried over at this point in time. The bigger picture is favoured and the man is captivated by the vision before him. He does not want to ruin this moment by worrying over the detail of his future, even though he might be advised to do so. If he did, it may stop or slow his progress, but it could also prevent him from making mistakes he may later regret. He is optimistic and positive about his success. After the struggle with decisions and restrictions of the Two, this man has made up his mind about what it is that he wants and no one is going to stop him. He has managed to free himself as we see the bolt that restricted the second Wand in the Two has vanished. He has now added a third Wand to his collection. This third Wand is very symbolic. The number 3 in numerology and in the Tarot has very powerful associations with creativity, growth, birth, abundance, movement and expansion. The man has used the energy of this third Wand to drive his plan of action forward. He has combined the initiative of the Ace (1) with the duality of the Two (2) to unleash the powerful force of 3. It may have been difficult and frustrating, but the third Wand has built a powerful momentum which has taken on a life of its own. Progress is now happening with little or no difficulties. The 3 forms a natural triangle and when upright is the symbol for the element of Fire. Fire when left unrestricted desires to grow upwards and outwards. It seeks to travel and expand its territory. Using the energies of his governing Element, Fire and the number 3 he is now free to go wherever he chooses. This is bound to keep him happy for the moment. The bright yellow sky and sea reminds us of distant exotic lands and this is where the man may have set his sights on. We know from the Two, as he held the globe in his hand, that his world, although perfectly fine, had grown too small for him. He had seen and done it all at that stage and was looking for something to re-ignite his Fire. The colouring in this card when compared to the Two gives the distinct impression that what the man now seeks is very far from home. His world has suddenly exploded into colour and he feels alive again. The decision process of the Two is now behind him and he has put his plans into action. He has moved forward in great leaps and bounds. He has climbed to the top of a hill or mountain not only to get a better view of this bright new world in front of him but also to oversee that which he has created or given birth to. Although he quietly watches the ships below him come and go, the fire within burns like a furnace. These are ships that he has set sail to carry both goods and information back and forth to the new world. He has a big plan, a vision of what is to come and all he might be. The ships symbolise the amazing voyage of discovery he is about to embark upon. This voyage will take him to exciting places where he will discover many new cultures and lifestyles. He will gain direct experience of how others conduct business and products that he could only every have dreamed of. He will meet interesting people who will inspire and encourage him. He will bask in the heat of his glory and come into his own power. He is now seen in a position of command and authority as he looks out over his business. Because the ships are also very symbolic of trade and commerce the man may have turned his attention overseas with the intention of expanding an existing business. His plan of action may be to expand into new territory and explore the foreign markets. He may be testing out the water by doing some market research and scouring the internet for ideas. He may be travelling and might have to visit many place before he finds the most suitable one for his venture. Ships ride rough seas to carry their cargo back and forth so that trade may flourish. Today our ships are built to withstand extreme weather and we can rely on them to dock safely. However, many years ago, individuals or business owners took great risk when sending large consignments of goods by sea. Many fortunes were lost and lives ruined when ships sank with their cargo during storms and disaster. This man knows well that by sending his ships out to sea he is taking a gamble. However, unlike his Pentacles colleague, he is happy to take such risk. He is not going to let himself worry or get bogged down about every tedious and petty little thing that might happen. He is taking the long view and looking at the Big Picture. He is also very optimistic and certain of a positive outcome. He is looking beyond the immediate circumstances and is prepared to move fearlessly forward into unknown territory and uncharted seas. This is a very positive and powerful card for success and good fortune. However, it does bring a note of caution with it. While the desire for this man is to run and not walk at his stage, it is important he pays a bit more attention to the small details of his situation. Significant aspects may be overlooked which may have a bearing on his long-term success. The last thing he wants or needs is to stopped in his tracks by negligent oversights or get tripped up by his own feet. The Three of Wands is a very strong card for Travel especially if found with any of the following cards; Ace of Wands, Eight of Wands, Knight of Wands, Six of Swords and the Page of Swords reversed. Depending on the surrounding cards and question, travel may be related to holidays, business or re-location. You may not be travelling that far but the Three of Wands often brings us to distant lands and hot sunny climates. This card brings success and good fortune when it turns up in a reading. You are bound to feel brimming over with self-confidence and self-belief. You feel assured of what you are doing. You may feel excited and full of enthusiasm for a project or venture you are working on as your creative juices flow unhindered. Life may have been a bit stagnant for a while but when the Three of Wands appears it brings the necessary change that is desired. You should feel energised and ready to take on a whole new life. 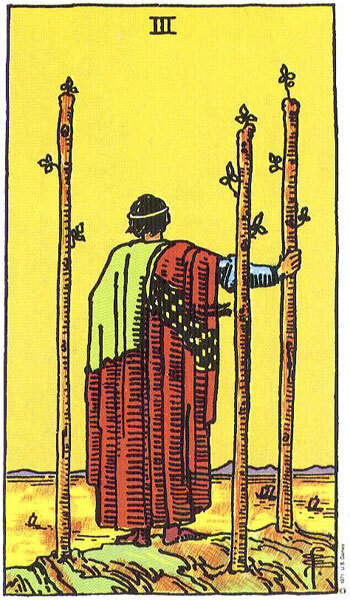 The Three of Wands is often associated with emigration. We saw the terrible dilemma in the Two of whether to stay with what was familiar and safe or take a chance of moving onto something new and challenging. It is the decision part that often paralyses us and brings pain. However, once a decision has eventually been reached, it often brings relief to all those involved. Instead of wondering and worrying about things, everyone now knows where they stand. Real plans can then be made and action taken. In the Three we see excitement and a sense of adventure take over from worry and doubt. You are happy with the decisions you have made and are prepared to take a chance on a new life. You feel positive about the future and enthusiastic about your new home and life. If you have been trying to break away from a troublesome situation or a painful past then this card indicates that you will indeed liberate yourself and move forward. It highlights a time when you are ready to move on with your life and turn your back on the past. There may be a few qualms of uncertainly but the overriding feeling is one of excitement and anticipation. You are seeking something completely different and new. You have no idea of what you might be letting yourself in for but you are prepared to give it a go and take a risk. The big picture is what counts now. Whatever you have been working on has taken off and results are beginning to show. The future looks bright and rosy from where you are standing. The Three of Wands brings with it a sense of personal power and becoming aware of your place in the world. It is a time of wonderful growth and personal development. You are ready to spread your wings and take on the whole world. Much can be achieved under the influence of this card as the situation and life are progressing nicely now. This may be an exciting time for you in general with so much to think of and organise. However, pay attention to the more mundane day-to-day issues as they still need to be addressed. In a relationship spread the Three of Wands is a positive card for relationships as it suggests growth and development. A fledgling relationship may be developing into something more. You may decide to marry, or the third Wand being introduced may suggest that you are actively trying to start a family. As a couple you see your future together as bright and promising. You should be able to move past or away from any troubles you may have been experiencing. The Three of Wands can also suggest a partner met while travelling overseas, on holidays or while working abroad. Long distance relationships are often highlighted by this Three. You may be in a relationship with someone of a different nationality or culture. As a couple or family, The Three of Wands often suggests you have decided to emigrate. This is bound to have been a very difficult decision to make. If you have been in an unhealthy relationship or have been trying to find a way to leave, The Three of Wands shows you packed up and gone. You should be able to free yourself and put it all behind you when this card appears in a future or Outcome position. If you have gone through a separation or divorce, the Three of Wands card turning up in your reading is very positive and healthy for it shows that you are moving on and getting on with your life again. It suggests that you are making a fresh start. This new start could involve you moving to a new location or just going on holidays. In a career spread the Three would suggest working overseas or looking to foreign companies for employment. This card often highlights the search before taking action such as checking the internet for career opportunities in other countries. Your mind is made up that you are going but you haven’t quite decided on where yet. The man standing on top of the hill remains in his own territory while he sends his ships out to do his scouting. This card can indicate you are travelling in connection with work or to further your career. You may be exploring new careers or job offers. You might also be transferring, or have applied for a transfer to an overseas branch of company you work for. You may turn your back on an old and outworn career in search of one that inspires and excites you. The Three of Wands career-wise is linked with the shipping business or foreign export. It is a very positive card for jobs and careers as it brings with it the potential for growth and development in these areas. In business, the Three of Wands can suggest you are trying to expand, enter into new territory or market new products. You may have decided to test out your products on the foreign market or look to overseas for inspiration. For certain you are thinking big and feel ready to make your move. You may be taking the necessary steps to open a branch at another location or even re-locate your business. You may be travelling back and forth from one destination to another to meet potential new clients who will help your business expand. This is bound to be an exciting time for you in business and you have big plans for the future. However, don’t forget to keep an eye on the business you already have. In your enthusiasm to get going you may take your eye off the ball at home and let things slide. You may be experiencing difficulties putting your plans into action or getting a project off the ground. You are eager to get going but try not to get too ambitious here. This is more than likely a temporary situation and one that will sort itself out in time. The situation will improve but being arrogant, obstinate and stubborn won’t get you anywhere under this influence. You risk isolating yourself and losing the support of those who have helped you so far. Just because you think your creation or venture is exciting and wonderful does not mean that others will feel the same . Although this card generally remains quite positive, even when reversed, it can indicate that a project or venture you are working on may fail. You will have to look deep into the reasons behind this. The Big Plan, Big Adventure or the Big Picture intoxicates you at present. Your enthusiasm, energy and passion is admirable but you must remember that the small details are important too. There are certain things that need to be in order before bigger plans can proceed or manifest. They may be small but are obviously significant. As a Wand, you may be in too much of a hurry to get going with whatever the situation is, but you need to exert patience at this time. You may feel tired and exhausted as you have expended too much energy in the initial stages. There is a chance that you feel overwhelmed or that have taken on too much. This is bound to leave you feeling depressed and stressed. Time to pick yourself up, dust yourself down and get back on track again. Don’t let this get the better of you. Approach things in a step by step and methodical manner. You need to step back from the situation and view it in a calm and objective manner. Learn how to pace yourself. When the Three of Wands reverses you may feel that you made a big mistake when making your decision in the Two. You now realise you never thought things through properly. A lack of foresight has made you act rashly or recklessly. The move you made or the action taken has been a bitter disappointment. You realise the grass is not always greener on the other side. Instead of leaving your past behind, it may very well have caught up with you. The ghost of the decisions taken in the two may be coming back to haunt you. You may have emigrated, bringing your family with you and now realise it was a mistake. This card can be a sign of homesickness and an inability to settle in a foreign country. Depending on the circumstances, you may have nothing left to return to and must stay where you are. However, you may have got stuck in the Two, unable to make a decision or take any course of action. Instead you spend your time in wishful thinking and what ifs. You fear change, risk and anything that is new or different. When the Three of Wands reverses prepare for delays, set-backs and difficulties with travel plans. You may end up disappointed with your choice of holiday destination. This card can also suggest the return home after travel or an ex-pat returning to his or her homeland. In relationships, the reversed Three of Wands suggests a lack of growth and commitment. The gloss may have worn off what you thought was a promising relationship leaving you upset and disappointed. The reversed Three of Wands can also highlight a rebound relationship. A partner may return to his or her ex-partner after realising they have made a terrible mistake. Instead of focusing on your current relationship you may be hankering after a past one. If you have been separated or divorced this card reversed can indicate you are finding it difficult to let go and move on with your life. If you are in a long distance relationship, it may be a sign that you are failing to sustain it. You may have commitment issues. You are unable to sustain the initial fire. Passion burns out quickly. You need to go back to the Two and decide what it is your want. Relationships may be too fast paced, intense too early. There may be a lack of support from your partner and, or family. They may not share your enthusiasm or vision. They may not want what you want. You may feel you are growing apart. On a lighter note, the Reversed Three of Wands may simply represent the typical holiday romance – great fun but short-lived. Career related the Reversed Three of Wands can highlight a lack of opportunity for growth and promotion within your career choice or job. You may be disappointed at the choices you made in the two when deciding on which job offer to take. 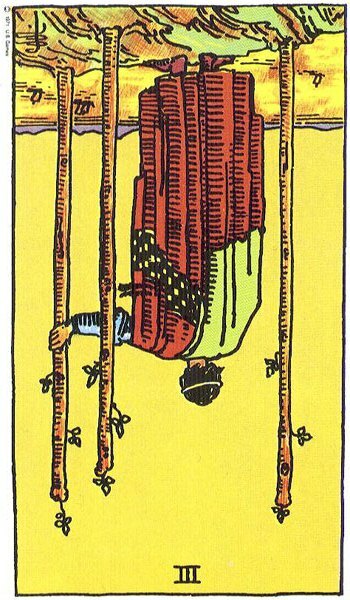 In business, the reversed Three of Wands suggests a lack of growth and poor decisions. You may have been so eager to launch a new venture you failed to do the proper research. You may be finding it difficult to break into the overseas market or possibly your business idea has not been received as well as you thought it would. You may not get the return you had hoped for from an investment. You may be up against stiff competition. You may have been duped or lured with false expectations and promises which have not yet materialised. You failed to read the small print re new job, business venture. You may have been given useless advice and listened to all the wrong people instead of conducting your own research. You have paid a terrible price for being overly ambitious. On the other hand this card reversed may simply indicate the return from a business trip or fact-finding mission. As a business owner you may not be keeping an eye on the day-to-day running of your business. Is your business in safe hands when you are not there? However, it may suggest a business man who has decided to take a less active role in his business. You may be handing the reins of power or operation over to a son or daughter . *When we next visit the Wands in Card 4 we will find out how successful their course of action has been. Once again, your interpretation have EXCEEDED my expectations. Without a doubt, your website is my #1 go-to for additional clarity on tarot. You hit the nail on the head each and every time I need further clarification. I found the above paragraph somewhat truthful, because it doesn’t serve us when we are searching through tarot site after tarot site for a “correct” interpretation. It can leave us very confused. I believe that WE set the tone of what each card means for us (as the reader) – and this based on our intuition. With that said, as I travel my own journey discovering tarot, it has been YOUR interpretations that has served me the best. Your interpretations have been the most accurate with my readings, and I have relied on my own intuition to tell me whether your interpretations are my own ‘truths’. It’s never failed me. Thank you again – from the bottom of my heart – for building Teach Me Tarot. I am learning so much from you. You are opening my eyes to seeing the beauty behind each card. I agree 100% with everything you just said!